What is the ‘cognitive-behavioural’ approach? The cognitive-behavioural model helps us understand our well-being and behaviour. It has received strong support in research for many years. The model looks at how ‘internal’ events such as our thoughts and feelings affect our behaviour. Our thoughts, feelings and behaviours each strongly impact one another. The Craving Change™ program is based on this cognitive-behavioural approach as it relates to our eating behaviours. Learn more about the cognitive-behavioural model with our ‘eating iceberg’ example. The physical act of eating is an action or behaviour. It is something we can see someone doing. Let’s compare eating to an iceberg. An iceberg looks like a little island of frozen snow floating in the ocean. It’s big. However, under the surface of the water lies a much, much bigger chunk of ice. In fact, almost 90% of the iceberg is under the water where we can’t see it. 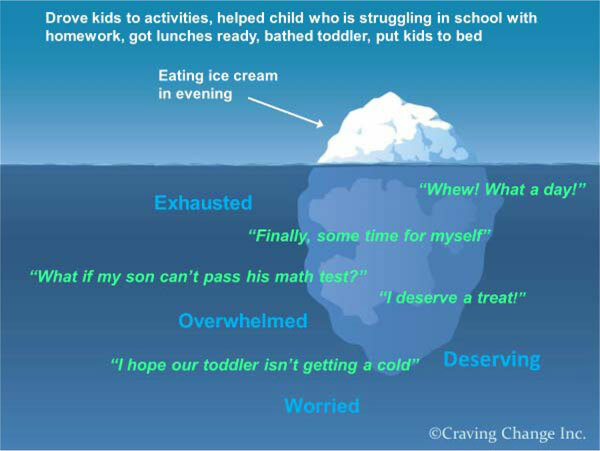 Think of the visible part of the iceberg as your eating behaviour. This would be what, when and how much you’re eating. Take a look at the iceberg diagram below. Imagine that you’re a busy parent with young children. You find yourself eating ice cream in the evening. This is your eating behaviour. But this is just the tip of the iceberg. Beneath your eating behaviour lie the answers to ‘why’ you’re eating the ice cream. This is what you can’t see. It’s what is going on in your mind. Beneath your eating iceberg are thoughts (green quotations) and emotions (blue font). Thoughts and feelings that you are likely not aware of at the time. Yet, what you’re thinking and how you’re feeling can have a powerful effect on what you’re eating. Become more successful at changing your eating by changing what’s going on under the tip of the iceberg. The Craving Change™ cognitive-behavioural approach will help you become more aware of your eating triggers. It will then teach you how to deal with these triggers to help you better manage your eating.